This book was very good and seemed to offer lots of useful advice but it seemed to be aimed at those with a certain type of disease pattern, perhaps the type which the authors were most familiar with. (Which is fair enough! )This book is great, probably, if you have a non-severe and/or relapsing and remitting disease. But I found very little here for coping with very severe disease with no breaks!The book very much asssumes throughout that patients will have periods of illness and then periods of wellness, or at least periods of being slightly less unwell.This just does not apply to Myalgic Encepahlomyelitis, and especially severe M.E. - nor to many other diseases I am sure. As such for those of us who fit this description, much of the advice in the book is inappropriate and can't be used and is also slightly depressing. (To read a book which assumes you'll have better health periods now and then, when this isn't the case and hasn't been for many years can make you feel a bit sad. )The problem of being bedbound, housebound or unable to speak for long periods, or write or have visitors, is also not mentioned at all.I don't mean all this even as a criticism of the book really, as I am sure this book is suitable for many poeple and the authors had to write what they knew. Also, when a book has 'invisible illness'in the title, I suppose this does to some extent suggest it covers diseases which do not leave you obviously visibly ill such as bedbound or housebound. That would be a very fair point as well of course. (Although many other diseases the book discusses are called invisible when really the patients do look ill, perhaps just not 'ill enough' for how disabled they are for some critical bystanders! )But I just want to add this comment about it not fitting all disease types as well for the benefit of readers such as myself who will not get as much out of this book as some others might. Horses for courses!This book seems great for those who do fit these disease types though. It contains much more than the usual superfical and commonly given advice. The authors clearly know this topic well and are passionate about the topic.Jodi Bassett, The Hummingbirds' Foundation for M.E. 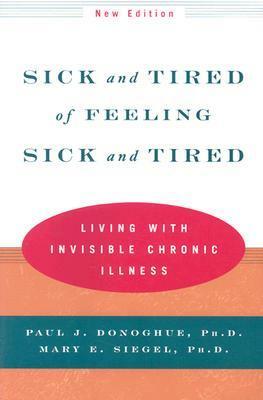 This book is a must-read if you are suffering from ICI (invisible chronic illness)and have been diagnosed after years of being put down by doctors of almost every possible specialty. It tells you not so much about diseases than about how people deal with being at times extremely sick and incpacitated while looking perfectly healthy for most people. Anytime someone sees me, they say "well, I don't understand, you look fine"... they wonder about the sick leave. Even down while I almost died at the hospital they still said the same. Because a few afflictions have the capacity to hurt and destroy you without a SINGLE external sign. As you go from doctor to doctor, they think the same as your friends and family (except your close family who actually see you suffer a lot and feel impotent) and you end up at the door of a psychiatrist with a recommendation from your GP. I was soooo relieved when they finally found out (a disease that is NOT mentioned in this book, spondylitis) , so relieved to know that I was right from the beginning. I felt legitimate again and reading this book makes your realise a lot of people experience the same struggle. You were not alone, feels good to read.That is true for the first part though, the second part is not as interesting as actually reading on CBT or non violent communication (which it is about), but still, I owe such people for sharing their experience. Good summary of living with an invisible illness. Some good advice, some new age crap but not very much of it. Also, made me pretty sure I have at least two extra diseases. This book was pretty good. The first section went over what an Invisible Chronic Illness is with examples and anecdotes, and how it affects someone not only physically but socially and psychologically. The second section is about learning to cope with chronic illness. I found it very helpful and even took some notes. It reflected some of what I have been learning lately in talk therapy, such as confronting irrational thoughts and learning better ways of communicating your feelings and listening to others feelings. The end of the book includes reading lists and contact information for various associations related to the chronic illnesses in the book. This was first published in 1992, with an introduction added in 2000 so some of the information and contacts may be out of date. I noticed a lot of the books on the reading lists were older as well. Also, there is a slight Christian/religious slant to some of the sections which I found a bit out of place, but it wasn't very overwhelming and was easy to ignore for someone who isn't Christian or religious. This wasn't terrible, but it wasn't the best book on chronic illness that I have read. I found it a little repetitive and heavy on obvious advice, like 'try to find a way to do some exercise' or 'find some time for pleasurable activities'. I thought some of the cognitive and communication techniques were quite good, bit I felt that they could apply to any stressful circumstance and not just chronic illness. I didn't hate the book. I just didn't feel like I learned anything new about how to live well with chronic illness. Mind you, I have already read several other books on chronic illness which I liked much better - possibly if this was the first book on this topic, I might be a little more impressed. First half was wonderful, the second half was garbage. They must have come up short in pages and tacked on a bunch of psychological and cliche mumbo jumbo. Read it, but as soon as you start feeling talked down to or like you've heard all this before, put it away. Otherwise you're going to waste your time like I did! the beginning seems very informative and supportive. You can tell that it was written through the eyes of people who have lived it.The rest of the book so far had really just been kind of depressing. It hasn't taught me any new ways of coping or explaining. I honestly don't know if I will finish this one. This is one of the few books on chronic disease that addresses how the person with the illness, and their families are feeling about the illness, the role it plays in their lives, and their lives' roles. I found it more helpful than most books about chronic disease. I agree with another reviewer that the first 3rd was worth the entire read as it describes illnesses. The remainder is valuable in that it helps lay people approach medical professionals and the psychological help is interesting to someone not familiar with the techniques. A helpful guide to people suffering from chronic illness. The best book I've seen on the subject! Great read but I got the impression the second half was an afterthought. Overall I gained a lot of insight.